Explore a haunted, ever-changing house in this ultimately dull horror game. What is it? A horror exploration game where you use echolocation to find your way. 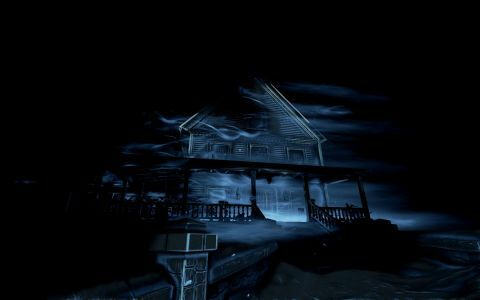 In Perception, you play a blind character using a Daredevil-ish echolocation ability to explore a haunted Massachusetts house. Rather than using this skill to throw fridges at goons in corridors a la Matt Murdock, though, you instead use these momentary glimpses of the surrounding environment to maneuver through the dark. It seems like an effective horror device at first, and it's based on a real methodology, but there's not much more to Perception than wandering through the pitch black while a spooky story about the house's previous residents happens around you. Cassie has come to this place alone, after seeing the house in visions and intensively researching its location. You use Cassie's cane to hit surfaces in each room, which gives you a brief but useful snapshot of the furniture and walls around you. Unfortunately for Cassie, the house's layout changes over the course of the game, as the timeframe shifts between the stories of previous residents, ranging from the recent past to several centuries ago. The other thing you have to worry about is a 'presence', which is basically a ghost that stalks the nearby area and kills you if you make too much noise. For the player, wandering around the house largely feels the same no matter which time period you're in, only with a few objects and surfaces switched out. While the sound design in Perception is outstanding, the game inevitably has the same dark colour palette throughout, meaning it's much harder to convey a sense of place. This is definitely a narrative game first, stealth game second. The 'presence' largely left me alone until the second half of Perception, where it appeared about ten or so times at most. You can use designated hiding spots if it turns up, but I didn't capture its attention enough to suss out what its patrol patterns were, so I basically just stopped using the cane as frequently. This isn't meant to be Alien: Isolation, though. The ghostly threat is just there to add a layer of tension in exploring the house—although I mostly just found it annoying. There are a couple of neat storytelling ideas to complement the premise of playing a blind character. Cassie can use an app on her phone to read notes scattered around the house, and another gets someone to call up and explain what's going on in front of her. These can offer a bit of foreboding depending on what's there, or even a solution to a puzzle. After about an hour, though, the appeal of using echolocation to find your way around pretty much wears off—and there's about five hours of game left after that. Perception doesn't have many inventive ways to scare you. One chapter throws a bunch of talking dolls at Cassie, for example, a groan-worthy horror staple that seems like a pretty naff use of the premise. Later in this chapter, a few of these little bastards fire gunshots at Cassie while moving around on tracks. Retracing your steps from a checkpoint is pretty irritating in a house filled with identically textured rooms. Better is the storytelling in Perception, which can be muddled but effective. The self-contained tales of what happened to the different generations of residents are told using ghostly apparitions, and the voice-acting is decent. Perception offers two modes of play at the start: one where Cassie offers more exposition on the house and her story, and another where she'll only deliver plot-critical details. I'd definitely go for the former if you're thinking of picking it up—Cassie is a well-rounded, well-acted and likeable character. She perhaps veers from sarcastic to scared a bit too wildly, but the writing has a nice Whedonesque rhythm, which lifts the experience of exploring. Unravelling the mysteries of what actually happened to the residents, and Cassie's connection to the place, is nice and grisly—it's just that slowly wandering around these boring rooms is not a strong enough hook to base an entire game on. Perhaps this is clever in that it illustrates the reality of being Cassie, but it sadly hasn't yielded a horror game that I'd recommend spending either your time or money on.